A senior Iranian official says the ongoing crises in the Middle East region can only be solved through an effective and all-out campaign against terrorism and extremism. “It is not possible to settle the ongoing crises in the region without an effective fight against extremism and terrorism,” Iranian Deputy Foreign Minister for Arab and African Affairs Hossein Jaberi Ansari said after a meeting with Lebanese Parliament Speaker Nabih Berri in Beirut on Friday. He added that conflicts must also be resolved through a political solution based on negotiations. “The Islamic Republic of Iran has a clear standpoint in this regard and believes that these two issues must be pursued in parallel [with each other],” the Iranian diplomat said. He noted that Lebanon has in two areas been a role model for all nations and states in the region over the past few decades. “Resistance against foreign occupation and the expansionism of the Zionist regime [of Israel] and coexistence among people of various ethnicities, faiths, political and social groups are these two very important exemplary [features],” Jaberi Ansari said. He expressed hope that regional governments and states would see better days in the future and the existing differences would be solved through understanding and dialogue. The Iranian diplomat also on Friday held a meeting with Secretary General of the Lebanese resistance movement, Hezbollah, Seyyed Hassan Nasrallah. During the meeting, the two sides discussed the latest political developments in the region, particularly in Lebanon. Fighters with the Lebanese resistance movement of Hezbollah defended Lebanon against Israel during the 33-Day War in 2006 and Tel Aviv was forced to withdraw its troops without the achievement of any of its objectives. Hezbollah has also been successfully helping the Syrian army fight Saudi-backed Takfiri militants in order to prevent the Syrian conflict from spilling over to Lebanon. Meanwhile, in a meeting with Lebanese President Michel Aoun in Beirut on Friday, the Iranian diplomat conveyed President Hassan Rouhani’s message to him. In the message, the Iranian president had stressed the importance of developing mutual relations in all fields, particularly after the election of Aoun as the Lebanese president. It added that Aoun’s election carried the message of understanding and cooperation among all the Lebanese based on wisdom and prudence. On October 31, Lebanese legislators elected Aoun as president, ending a 29-month presidential vacuum. The Maronite Christian founder of the Free Patriotic Movement succeeded Michel Sleiman. On Sunday, the country announced forming a new 30-minister cabinet led by Prime Minister Saad Hariri. The government brought together the country’s whole political spectrum except for the Christian Phalangist party, which did not accept the portfolio it had been offered. 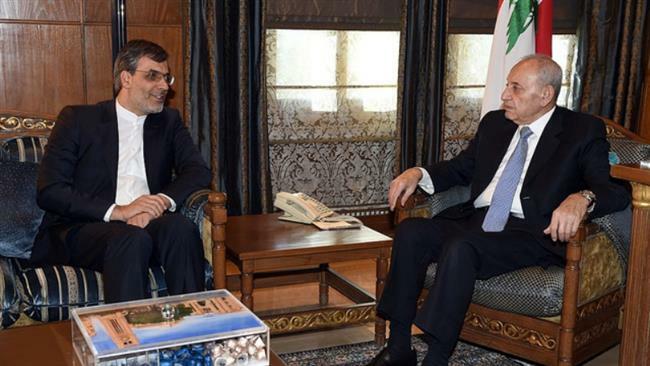 Elsewhere, Jaberi Ansari reaffirmed the Islamic Republic’s support for the Lebanese leaders’ approach of settling the country’s political differences through dialogue and national agreement, calling for such a policy to be adopted by all regional countries to resolve discords. The Lebanese president, for his part, hailed Rouhani’s attempts to strengthen mutual relations and said the Islamic Republic plays a positive role in regional developments. Aoun added that the recent meeting among the Iranian, Russian and Turkish foreign ministers in Moscow was an important step to settle regional crises, particularly the Syrian issue. Iranian Foreign Minister Mohammad Javad Zarif and his Russian and Turkish counterparts Sergei Lavrov and Mevlut Cavusoglu, respectively, held a meeting in Moscow on Tuesday and discussed the latest developments in Syria, particularly those concerning the newly liberated strategic city of Aleppo. Jaberi Ansari arrived in Lebanon after he wrapped up a visit to Syria, where he had met separately with President Bashar al-Assad, Prime Minister Imad Khamis and Foreign Minister Walid al-Muallem.